On my previous visit to Lan Zhou Hand Made Beef Noodle (or China Noodle King depending on which sign you read) just a couple of weeks ago, I ordered badly and didn't really enjoy my lunch which was my own silly fault. However I knew there was something special about the place. It's always busy, there's a small army of staff in the open kitchen, including a full time handmade noodle maker bloke, and there's something about the place that suggests the owners really know what they are doing, it seems just a bit smarter than your average hole-in-the-wall North Chinese joint. This time we try #1 on the menu, soup with handmade noodles and beef. The cold roast beef is served on the side, it tastes like western roast beef and is extra lovely when dunked in the broth. The thin handmade noodles are divine but for us the real star of the show was the broth, oh my god, it was one of the tastiest Chinese soups we have ever tried, in fact Miss Chicken declared it her all-time favourite. A big call, we eat a lot of noodle soup. The flavour was subtle and delicate, familiar yet unfamiliar. It was sort of like Chinese pho, but not really. The waitress told us the broth is made using 30 or so spices and beef, and is cooked for eight hours. Chili, shallots, coriander and white radish are added at the end. Pickled veggies are served on the side. If you are a fan of noodle soup then you really should give this a try, we really think it is something extra special. 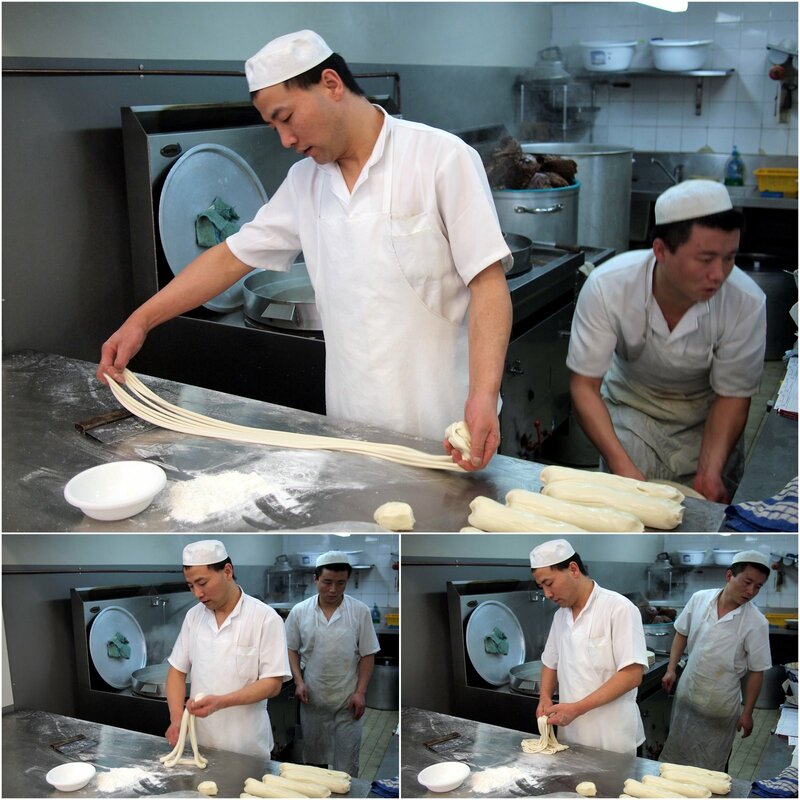 A bit of googling tells me that Lanzhou handmade noodle soup is popular worldwide, I learn something everyday, such is the joy of food blogging. I try #6 on the menu, stir fried handmade noodles with beef. Delicious and not too oily as this dish can sometimes be. It's a massive serving, enough for two. Lamb kebabs, $2 each or 6 for $10. Available in 'spicy' or 'not spicy'. I went spicy of course. Strong cumin flavours, cooked thoroughly, I can just imagine eating this on the side of the road somewhere freezing cold in the boon-docks of China. Yum. This photo is actually taken the day after we had our soup, I liked it so much I came back for lunch the next day, like everything the soup was not quite as amazing as the first time, but still excellent. Lan Zho Hand Made Beef Noodle is at 800 George Street, Chinatown. See our previous post here. A big shout-out to the lasses doing the serving tonight, they cracked a few jokes and made us laugh. Wow,the noodles looks delicious.Can't wait to go there.Love your blog!Really enjoy reading the articles.The menu is good idea. Anyway,thank you for sharing your experiences. I went there, really love it. but my companion got a little stomach upset from there. I lived in Lanzhou for a year and I can tell you those photos look like the real deal!! Sooo glad I saw this post, can't wait to go there and eat the real thing!